Opposites attract... and sometimes combust. Maya Winters, a firefighter, heads out on Halloween to dance at her favorite club. A man with haunting eyes watches her from the back of the club. He's just her type--a dark, brooding bad boy. She feels their connection, but thinks it's merely physical attraction. 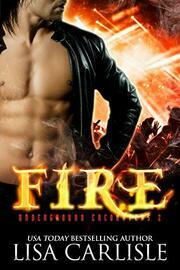 Fire is a novel in the Underground Encounters series, set in a club that attracts supernatural creatures. Each book features a different couple and can be read on its own. Don't miss this Night Owl Reviews Top Pick! "I don't want to spoil the story but let me say this... you NEED to go and read this, NOW!" ~ 5 Candles from Satin Sheets Romance.